Being newlyweds we had just moved into our first small home and one of our first purchases was a washer dryer combination. We studeied the various reports and felt that Whirlpool had a very good name and we pais approximately $1000 for the unit with free delivery. The LTE 5243D seemed to be an excellent choice as it fit in my very small laundry area. The very first negative to hit us was the noise this washer dryer combo made such a loud noise in use that we could not run it and watch television or listen to the radio at the same time. That was very disppointing as we could not try to finish the last load before we would go to bed as the noise would keep us up. We were also very unhappily surprised when we saw our first utility bill as this unit is NOT energy efficient and since we cant put much into it at one time we have to run it many times over to clean the clothes of just two adults. Overall our experience with Whirlpool LTE 5243D has been negative and would not reccomend it to anyone to buy especially at $1,000. In some cases we have actually had to throw away clothese becasue the dryer has shrunk to such an extent that the clothes were too small to wear. No matter how I played with the controls was I really able to get a understanding of the heat that was being used. Actually I believe that their is a problem electronically with the controls as they seem to act differently most every time I try to adjust them. contacting Whirlpool for help is a very difficult situation as one must wait for ever for their customer service people and most dont understand what I am trying to tell them. I am not sure if customer service is out sourced to India but it seems so. Join in and write your own page! It's easy to do. How? 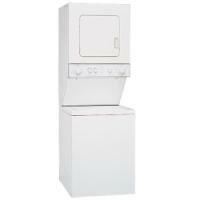 Simply click here to return to Whirlpool Washer Dryer Combo.